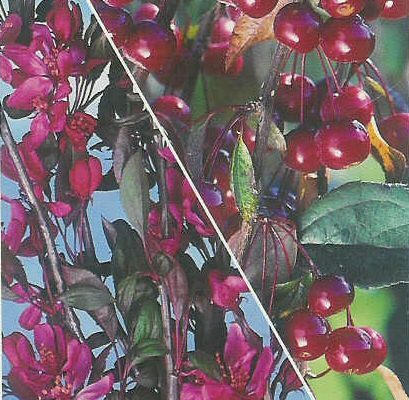 A extremely attractive small crab apple tree, Royal Beauty (Malus 'Royal Beauty') is distinguished by its slender, hanging, reddish stems of bronze-purple foliage. 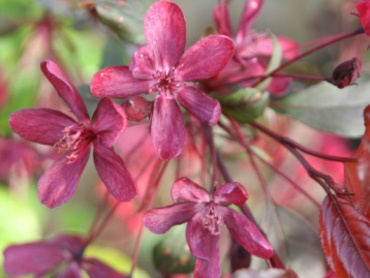 In May its purple-red to deep pink flowers are a real show, this followed in Autumn by dark red crab apples which is then followed by bronzed yellow leaves. The crab apples last well into the winter which should keep the birds coming back to your garden. Super glue on the branches or peanuts on a string are other ways of keeping birds in your garden but then you may have a few visits from various government organisations about this. Good for small gardens as this tree can be expected to attain a height of 2.5m (8ft) with a similar spread. It is also good for large gardens but will obviously look small if surrounded by lots of bigger trees! Considered to be clay tolerant which means if clay turns up at the door unexpectedly that it will silently "harumph" with a discreet eye role but still put the kettle on. Royal Beauty is supplied at of height of between 1.25 and 1.75 metres and in a 12 litre container, which means that the tree can be planted any time of the year and with better results than either bare-root or rootballed trees. 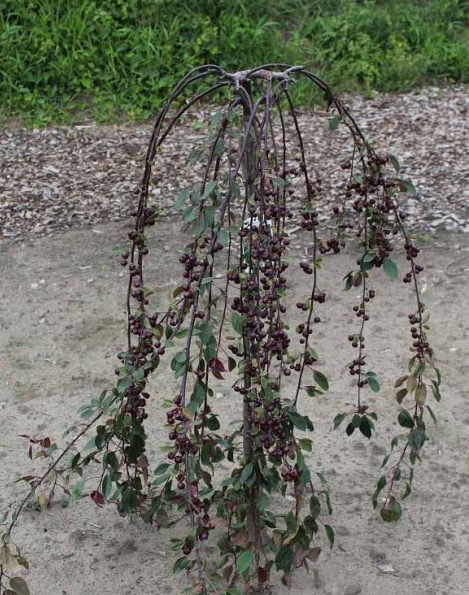 Should we be out of stock of Malus Royal Beauty then Malus Sun Rival is a similar weeping crab apple tree.